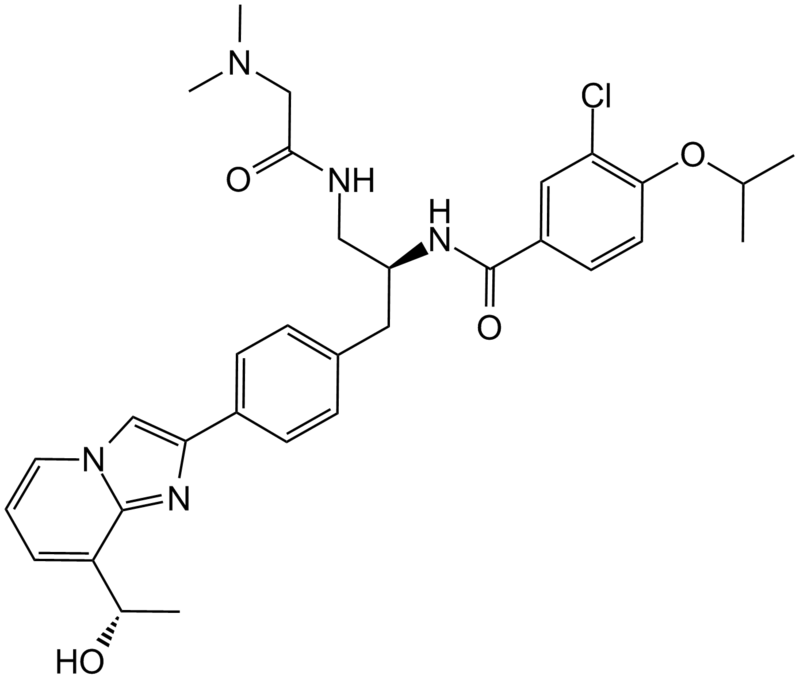 Description GSK-923295 is a small-molecule inhibitor of the mitotic kinesin centromere-associated protein E (CENP-E) with Ki value of 3.2 nM. Kinesin motor domains were expressed in Escherichia coli BL21 (DE3) and purified. CENP-E proteins included residues 2 ~ 340 with a carboxyl-terminal 6-his tag. All studies using MT were conducted in PEM25 buffer [25 mM PipesK+ (pH 6.8), 2 mM MgCl2, 1 mM EGTA] supplemented with 10 μM Paclitaxel. The IC50 for steady-state inhibition was determined at 500 μM ATP, 5 μM MT and 1 nM CENP-E in PEM25 buffer. In 237 tumor cell lines, GSK92329 potently inhibited tumor cell growth, with an average GI50 of 253 nM and a median GI50 of 32 nM. GSK923295 exhibited robust and dose-dependent antitumor activity against Colo205 xenografts, including partial and complete regressions at the dose of 125 mg.
GSK923295 is a specific inhibitor of CENP-E kinesin motor with IC50 value of 3.2 nM . Centromere-associated protein E (CENP-E) is a mitotic kinesin, which is the connect of mitosis process with the mitotic checkpoint signaling. It Interacts with spindle microtubules and contribute to the chromosome alignment, and thus it regulates the cell-cycle transition from metaphase to anaphase. When asynchronous cultured cells were exposed to GSK923295, the penetrant cell-cycle delay in mitosis was observed, which accompanied with morphological changes similar to RNAi-mediated knockdown of CENP-E mRNA. It indicated a significant inhibition of CENP-E by GSK923295. In the presence of GSK9232195, CENP-E microtubule (MT)-stimulated ATPase showed a dramatic slowing of release of ADP and Pi, where the ATP-bound form was stabilized and the activity of CENP-E was inhibited. This observation suggested GSK923295 inhibited CENP-E via the suppression of MT-stimulated ATPase . In mouse model, mice bearing xenografts of the Colo205 colon tumor cell line were administered with GSK923295 of 125 mg/kg. The result showed GSK923295-induced cell-cycle changes of tumor cells and increased scattered apoptosis body. Additionally, long-term study via measuring tumor volume revealed significant antitumor activity of GSK923295, in a manner of dose-dependent .